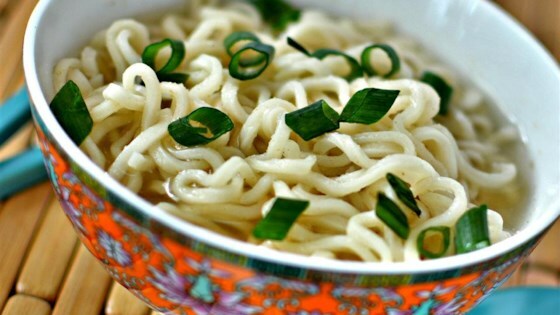 "A quick recipe to help get rid of all the unnecessary chemicals of normal top ramen, while keeping the flavor." Bring 2 cups water to a boil in a saucepan. Cook noodles in boiling water until tender, about 3 minutes. Stir garlic powder, onion powder, and ginger into the noodles and water; season with salt and black pepper. I do believe that the 2 tablespoons each of the spices are way off. I initially made this with one tablespoon of each and it was still off. Perhaps teaspoons would be in order but I'm not sure. Waaay too much on the spices, I'm going to try teaspoons next time around. It's rare for me too dislike something a much as this. I did 1t of ginger and 2t of garlic and onion powders. I'd put ginger in the fraction of a teaspoons. It really overpowers everything else.